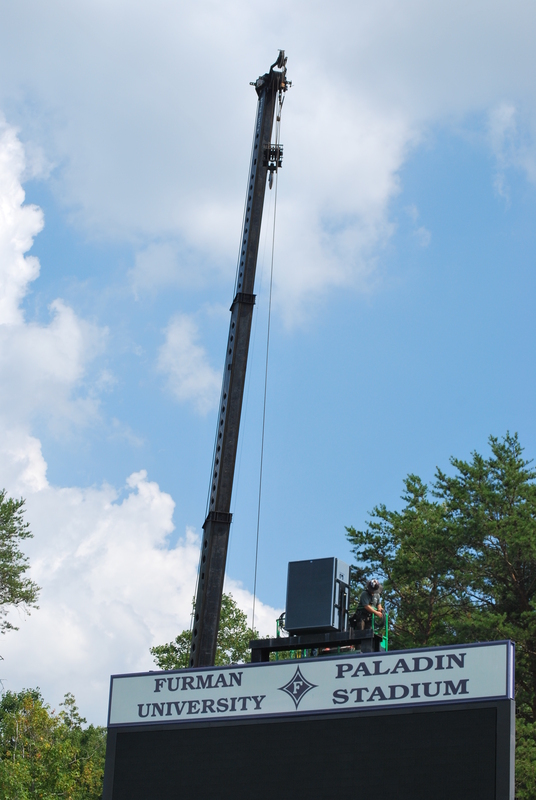 Paladin Stadium - Productions Unlimited, Inc. | Productions Unlimited, Inc.
Productions Unlimited, Inc. completed the installation of a new sound reinforcement system in the Paladin Stadium on the campus of Furman University in Greenville, SC in 2013. 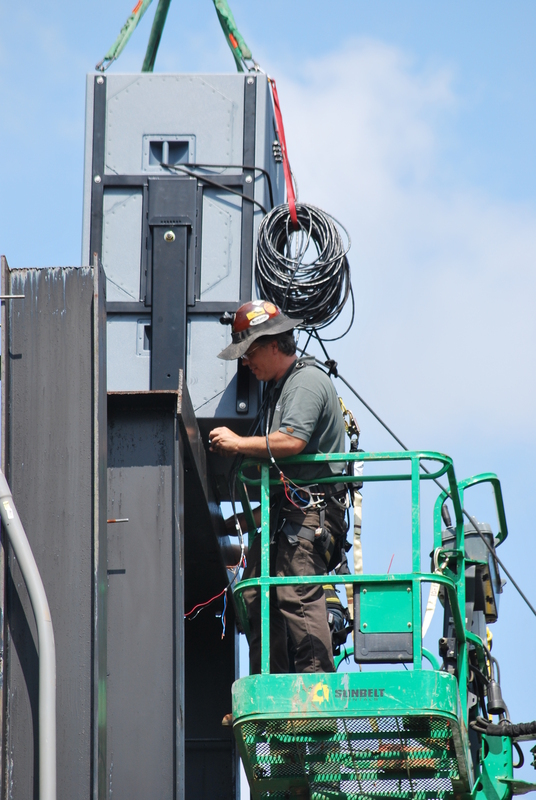 This work was part of a multi-million dollar renovation of the 32-year-old stadium. 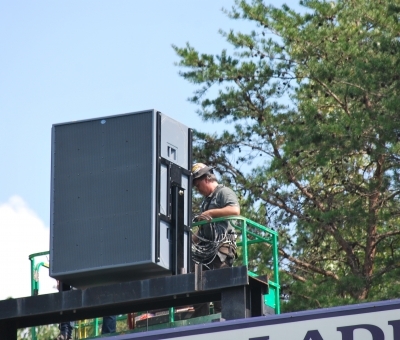 When PUI was approached about the project, Furman officials requested a system that would offer comprehensible speech reinforcement as well as the ability to play back modern music and advertising clips, all in a system that could fill the stadium with full range sound. 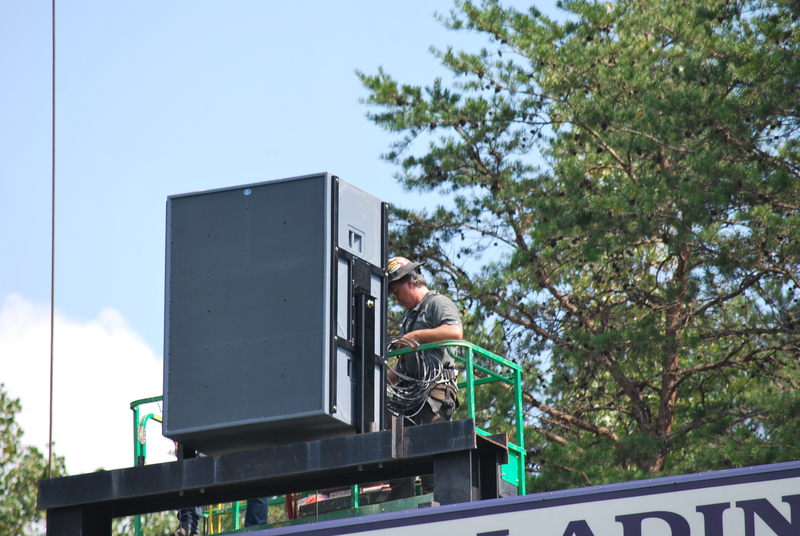 The original system consisted of a component horn system mounted to the end zone scoreboard and powered by amplifiers in the media booth on the fourth floor of the press box, approximately 500 feet away from the scoreboard and the speakers. 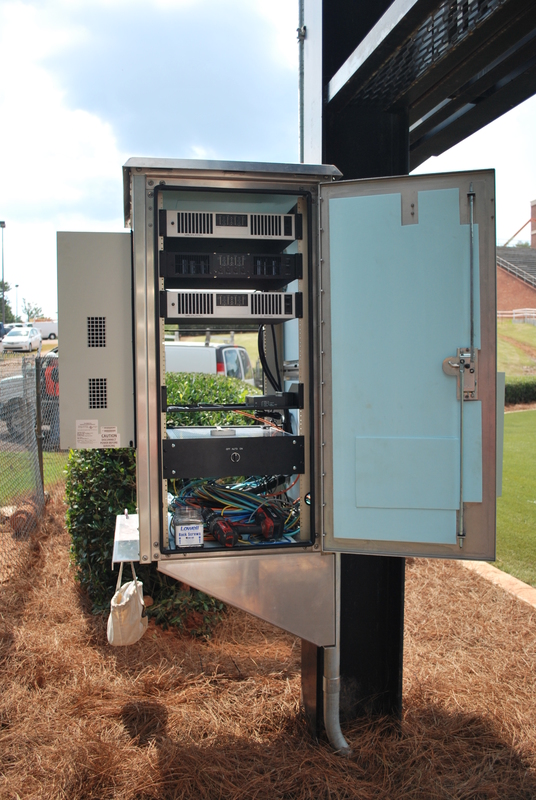 Many of these components were installed when the stadium was originally built in 1981. 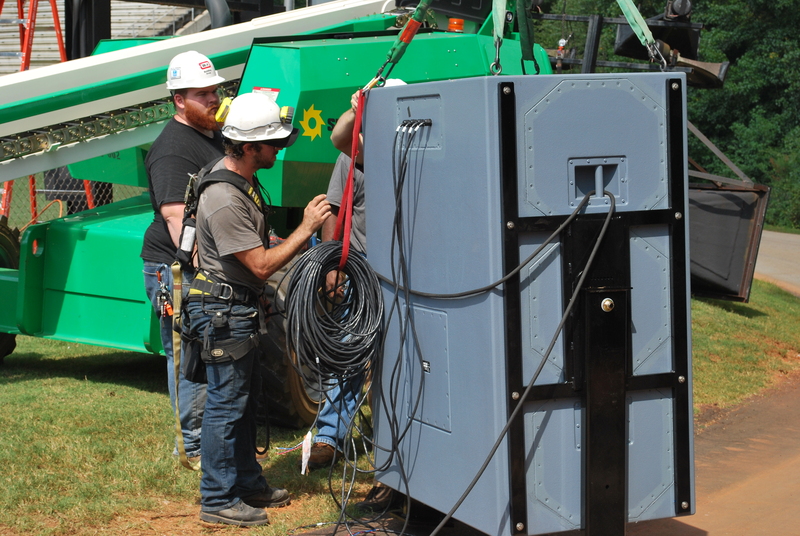 Voltage drop of the speaker cabling in addition to the aged equipment led to a system with poor and inaudible sound. 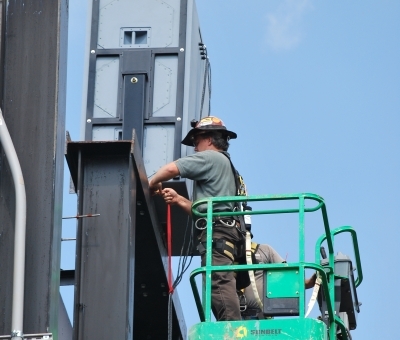 The university was very interested in a solution that would provide a more reliable system. Productions Unlimited Inc.’s president Brian Phillips and audio engineer Kevin Little began the process of designing a system that would fulfill the needs of the university, as well as fit within the budget and time constraints of the project. 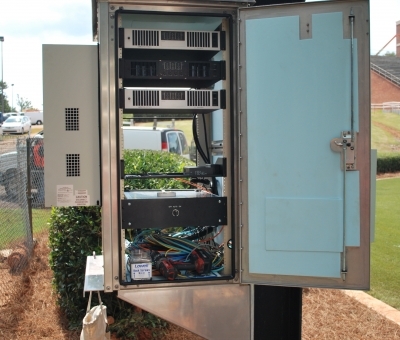 Many system configurations were considered, but in the end, a scoreboard-mounted single-source speaker enclosure, fiber optic signal transfer, climate-controlled amp rack, remote controlled power switch, and a complement of both wireless and wired microphones were selected for the project. 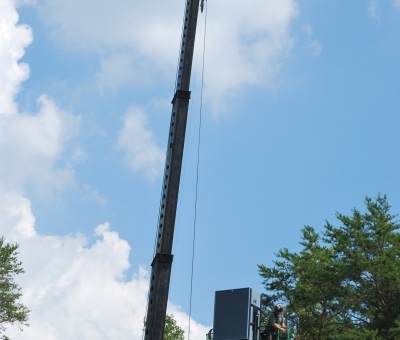 The single-source speaker system was comprised of a Danley Sound Lab Jericho J1-94 loudspeaker, which has a combination of 15 drivers to provide one powerful full range box and produces clear sound over 400 feet away. No matter where a person stands in the stadium, they are able to hear the sound with clarity and ease. 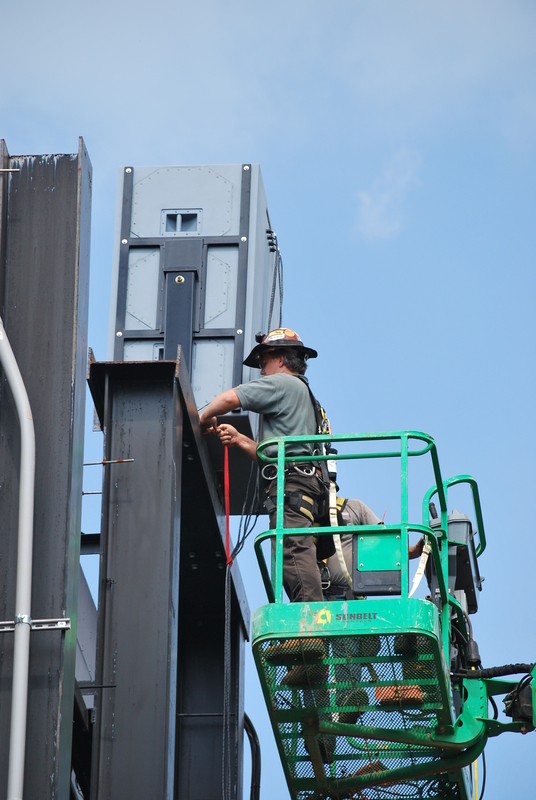 The speaker was mounted to the top of the scoreboard with a custom adjustable tilt bracket that was manufactured in PUI’s metal shop. 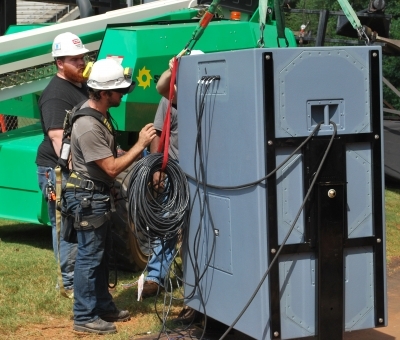 A fiber optic signal transfer system was selected to cut down on the length of the speaker wires and to minimize delay in the system. 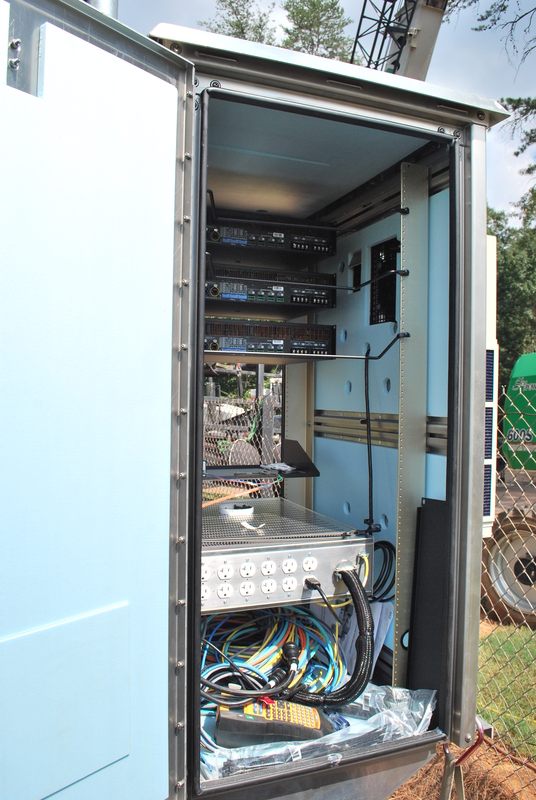 The Lab.gruppen amplifiers were mounted in a weatherized, climate-controlled amp rack manufactured by DDB Unlimited, so that the amplifiers could be within 75 feet of the speaker enclosure. This allowed speaker wire runs to go directly from the speakers to the amplifiers without splices. 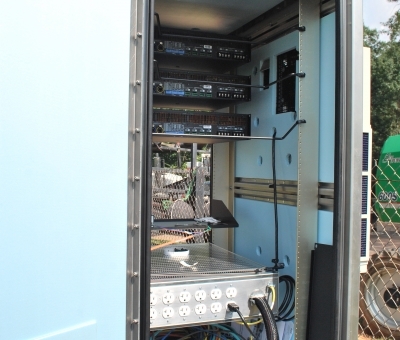 Switching of the amplifiers in this remote rack is handled by an SSRC Switch Box relay control box and switched by a SwitchCycle™ programmable sequencer that was rack-mounted in the press box media booth. Signal is fed from a Tascam CD-500B CD player, iPod dock, Audix OM2-S, Sennheiser MKE104-EW kit, and a Sennheiser EW 312 G3-A wireless referee mic system with antenna mounted on the exterior of the press box, with control provided in the booth by an Alesis MultiMix 10 mixer. 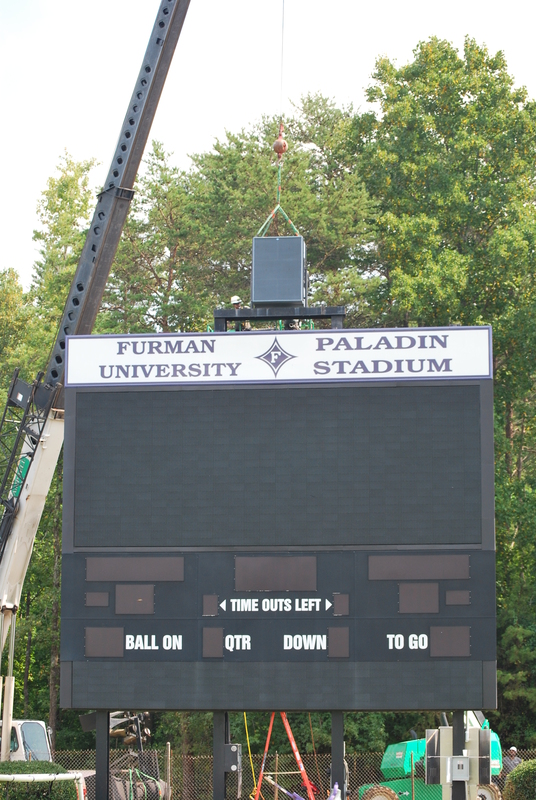 Furman University officials are very pleased with the new system. Fans were blown away after hearing the system for the first time. Many mentioned that for the first time in a long time they were able to clearly hear the music and announcements. 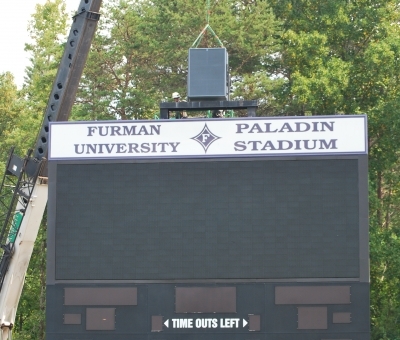 Productions Unlimited, Inc. would like to thank Furman University for giving them the opportunity to work on the Paladin Stadium sound system. 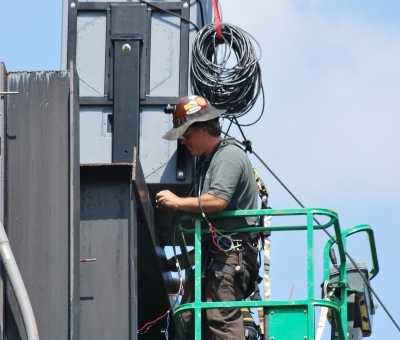 PUI’s team of experts would be happy to design your next audio, lighting, video, or rigging system for similar results.